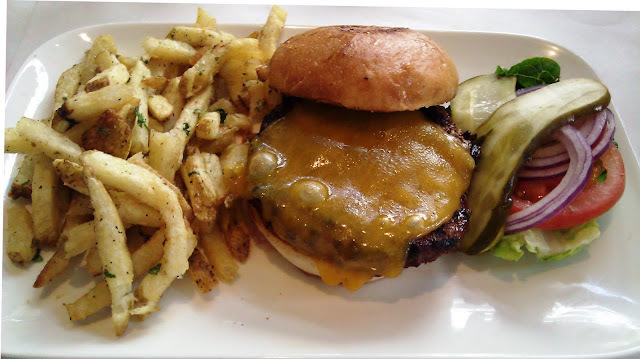 Annabelles's Bar & Bistro did not make any lists of great burgers to try in San Francisco. No one suggested that we try it. We did not plan on going there. It was simply close to our location when it was time for lunch, and we were pressed for time. They were doing a brisk lunch business, but they were able to seat Fat Bruce Lee, our guest, and myself promptly. We ordered a couple of burgers at $13.50 apiece and settled in for 10-minute wait. Once our burgers arrived, it became abundantly apparent why Annabelle's Bar & Bistro was not known/recommended for their cheeseburgers. 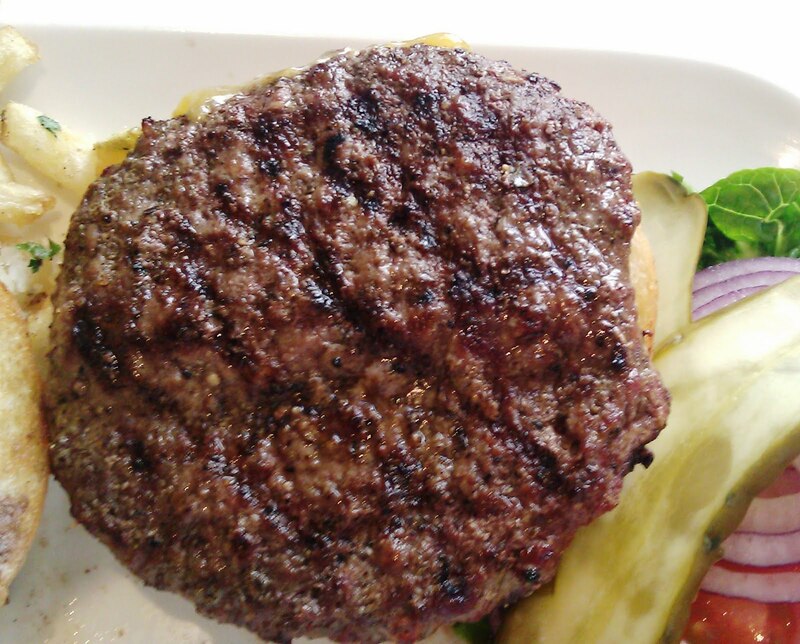 The Beef: Yawn...1/2 pound patties of pre-ground, 80:20, Niman Ranch Chuck. Super Duper was the only place the we have ever tried that truly made Niman Ranch Chuck work--it generally fell pretty flat. That trend was not bucked at Annabelle's. The beef was only mildly beefy in flavor. My burger was peppered with connective tissue. The beef had no trace of aging. The burgers were very greasy rather than juicy. The Seasoning: There was a dash of salt and pepper applied to the exterior of the big, greasy, bland patties. The salt did not compensate for the lack of flavor. The Sear: The sear from the grill was moderate, and there was even a slight char, but no real flavor or texture was developed. This was also due, in part, to the fact that my burger came out dead Rare rather than the Medium, which I had requested. The Preparation: The Chuck arrived pre-ground (medium-coarse) and was formed into thick, irregular, 1/2 pound patties. It was cooked on a gas-fired grill. It was not cooked nearly long enough. 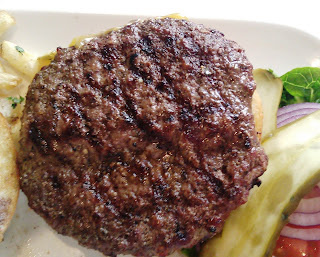 To top it off, for some reason the patties were placed on the plate prior to being set on the bun. The copious grease from the patties then saturated the exterior of the bottom bun, which made it a greasy mess in the hand. The Cheese: Yawn....this was ho-hum Tillamook Cheddar. It was bland, rubbery, and it contributed almost nothing but more fat to the dish. The Bun: The bun came from Italian-French Bakery, and the bun was terrific. It was a burger bun made from Italian bread.....WIN...it was savory, sweet, and just chewy enough! Sadly, the bottom bun was unpleasantly oily to the touch. So it goes. The Meat To Bun Ratio: The greasy beef was too much for the superb bun. The Fries: The house-cut fries were cooked in rice bran oil....these were adequate, but they should have gone an extra 30 seconds in the fryer to get some color on them. The fries did not maintain their crispness, and this was unfortunate considering that was the strong point of rice bran oil. The Value: I was in a hurry, so I ate half and sent the rest back. $13.50 for a weak burger was too much no matter how big the burger. Quantity rarely trumps quality. The value was poor. When General Manager, Micah Tell, inquired about the quality of the burgers, I shared my opinions with her. She did agree that the burger was undercooked. In spite of that, the check arrived for the full amount and with a straight face. I called Ms. Tell back to our table, and after a bit of back and forth she grudgingly agreed to adjust the check amount to reflect the half burger that I managed to eat. Her attitude was far more spicy and interesting than the cheeseburgers. It seemed safe to assume that Annabelle's Bar & Bistro did not base its business on repeat customers. The pickles were darn tasty, though. 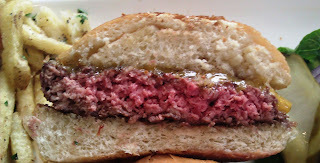 Burger Review : Pass on the greasy blandness.